From the beloved Kermit the Frog to the wacky Oobi, kids love puppets. It can be a full-blown puppet show with a whole cast of characters or a single puppet assisting during a read-aloud. Puppets are a great way to enhance your child’s literary experience while completing their homeschool lessons. Our first family puppet was an awesome Kermit for our now oldest child. It was a full body puppet including legs, not like those half-body cut off at the waist ones they sell now. He has been through a lot. Several puppet shows, 100s of play times, read alouds, narrator of a Jim Henson biography for a homeschool co-op presentation, and he even suffered major optical reconstructive surgery after a horrible accident involving an overzealous family pet… Nearly, but not quite yet a velveteen frog. Our next batch of puppets was a set of Baby Einstein animals. We probably had 10 different characters used on the VHS tapes and DVDs. Again, they were used quite extensively, this time by our set of twins. Also notable are our set of 3 shark puppets from the Finding Nemo movies. One of Bruce’s fins is a little worse for wear, again from a fight with the dog… but this time, in the dog’s defense… Bruce usually started it. He’s a shark, he couldn’t control himself. Most of these have been handed down to our youngest, who has now had her fair share of use with them. Our most recent puppet purchase occurred just this past Christmas 2016. We found some wonderful Cate and Levi premium reclaimed wool handmade puppets on Amazon. You should have seen the eyes of a 17, 14, 14 and 7-year-old alike, all light up when they all opened puppets at the same time! These puppets are really incredible. They are made out of reclaimed sweaters, so each one is a unique one-of-a-kind creation. If you order 3 elephant puppets, they will all be shaped the same, but the color scheme and texture will be wildly different. When we purchased 6 of them just this past December, they were all around $20 each. But now some of them are as little as $5.38 and up. They have a moose, bunny, horse, beaver, dragon, elephant, giraffe, hippo, monkey, walrus, dog, frog, shark, cow, cat and unicorn – probably others too. Highly recommended. They also have a line of polar fleece puppets, which are brighter colors and each animal looks the same, but they are not nearly as awesome and unique as the reclaimed wool ones. OK, so what do we actually do with all of these puppets? Puppet shows! The most obvious would be to re-enact their favorite stories behind the couch or an oversized chair. Or they can create a puppet theater out of a large appliance box or other suitable cardboard structure. Tension rods with an old curtain running across any doorway also create a fully functional makeshift puppet theater. You child’s imagination can run wild using an existing favorite story or creating their own original tales as a creative writing assignment. Read aloud assistants. Adding some flavor to your current read aloud sessions might be as simple as having Kermit or a wool sock puppet horse take over the reading duties. Having a puppet on your hand practically forces you to use another voice… more so if you have multiple puppets “on hand”. Of courrrrrrse, a horrrrse puppet will rrrrroll his Rrrr’s, and neighhh his aaaa’s. You can also give your children puppets and assign them roles to join in. They can then wait for their character’s part to come and either speak the lines or dance and act out the scene. This would get pretty chaotic during every read aloud session, but it makes a great occasional treat. Create your own. Sock puppets can be rather simple or ridiculously complex. When our oldest daughter participated in a homeschool biography fair, she was supposed to do a biography presentation and supply a related craft activity for the group. As our family are huge fans, she chose to do her biography about Jim Henson. We bought a 10-pack of colorful socks, some yarn and a bag of large googly eyes. After she and Kermit read the bio, everybody got to grabbed a sock and created Muppet puppets. The possibilities are endless, so don’t throw out those socks that lose their partner and be sure to save buttons and scraps of cloth or craft felt. We have even been at a store and seen a pair of socks that would make a “perfect sock puppet” and bought them specifically make puppets. You can also use simple popsicle stick and cardstock cutouts as puppets. So how many puppets do I need? Your puppet collection does not need to be as extensive as your home library book collection. Your puppets love to act, just like your kids. There is no reason why your monkey puppet can’t act out the role of Max from Where the Wild Things Are… unless you actually already have a Max puppet wearing a wolf suit. Then your monkey would have to be OK with picking a different part. One of the other wild things will have to do. You can even accessorize or dress up your puppets in simple costumes to help them get into character. If your wool sock puppet hippo had a piece of scrap red cloth tied around his neck he could have a cowboy bandanna, or over his face to be a robber, or on his head to be little Red riding hood. See how creative you can be putting together a vast wardrobe of puppet outfits for various occasions or favorite stories. Your children can even be inspired to create simple paper masks and rubber band them around the puppet’s head. There is really no right or wrong way to play with puppets or act out your story. Just have fun. 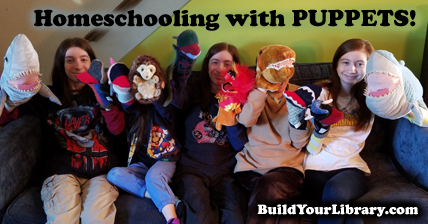 Can you think of any other creative ways to enhance your homeschooling with puppets? Let us know below in the comments!